Well-managed PPC advertising campaigns can offer a strong return on investment, but there can be a steep learning curve required to run campaigns across each of the major platforms. Alongside getting to grips with varying terminology and multiple campaign management platforms, a significant time investment is required in monitoring advertising bids and keyword selection to optimize clicks and stay within budget. 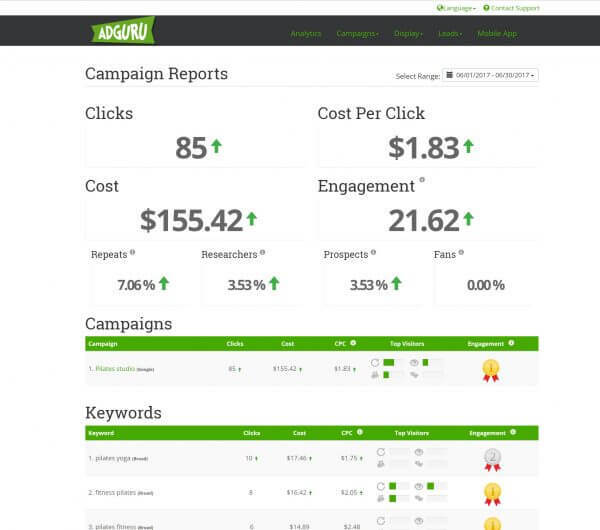 AdGuru simplifies campaign management to optimize your PPC ads. The platform uses behavioral and predictive analytics to constantly analyze and predict a user’s likeliness to complete a goal. AdGuru works to leverage the performance of keywords that produce the most clicks, optimizing the use of your advertising budget by intelligently allocating spend to the keywords that deliver your sales and marketing goals. Alongside AdGuru’s intelligent campaign analytics and insight, you’ll benefit from dedicated expert advice and support from an AdGuru advertising specialist. Within 24 hours of purchasing a campaign, a specialist will review your plan and contact you with advice to optimize your spend and give the campaign an initial boost. From there, you’ll receive a personalized status of campaign progress from your AdGuru specialist, detailing the actions that have been taken to optimize your advertising and recommend additional actions that will help you reach your goal. It can take around two months to test and optimize campaigns, so expect to see results from your advertising activity in five to ten weeks. 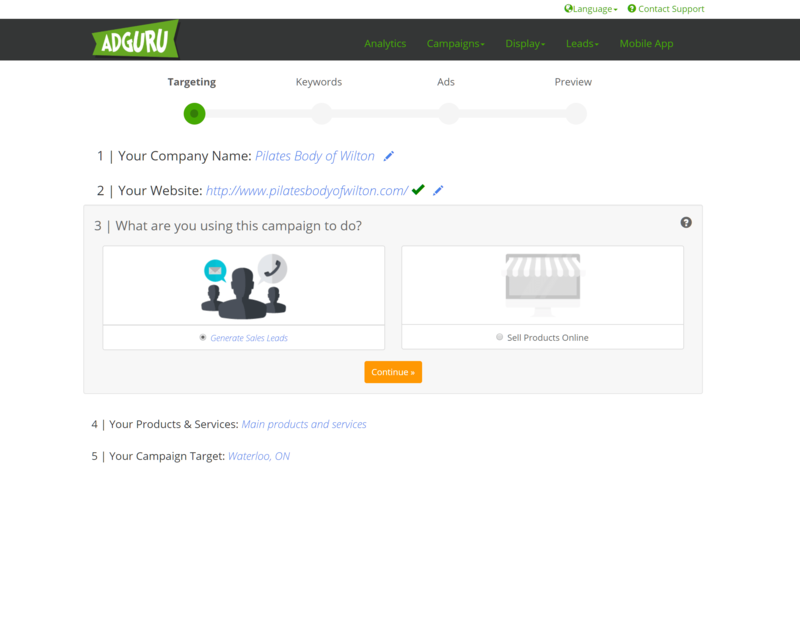 You can review your campaign at any time from the AdGuru portal. Shortly after you sign up for your AdGuru account, you’ll receive a welcome email which includes the details you need to access the AdGuru Portal. You’ll find it’s easy to manage and monitor your online advertising campaigns using AdGuru’s suite of analytics tools and reports. Feel free to log into the dashboard and take a look around as we explain how campaign management works. 1. If you are using HostPapa Website Builder. You don’t need to do anything. The code will be automatically updated for you. 2. If you are using WordPress or any other CMS, hosted either with HostPapa or any other hosting service. In this case you will have to get the code from your HostPapa dashboard and install it on your website. To get the code, go to Dashboard > My Services > Marketing Tools > Product/Service and select AdGuru. Click on Download Code Snippet. Once you’ve done this, you will get the following screen from where you can copy the code. Remember, the code should be placed just before the closing </body> tag. 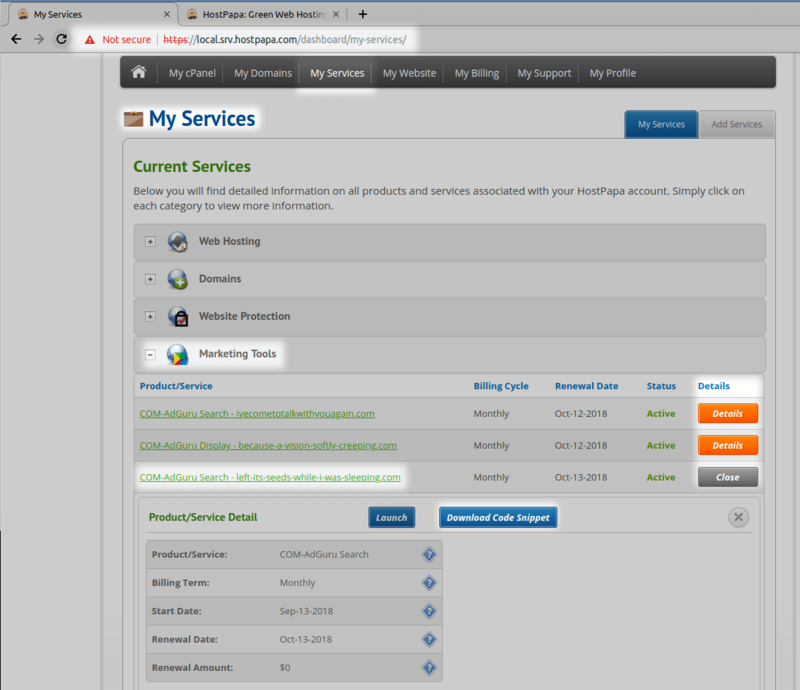 The plugin will be automatically installed in your WordPress interface when AdGuru is set up for you. All you need to do is activate the plugin. Go to your site’s WordPress interface -> Plugins. You should have these files in your system. If the plugin installed successfully, go to your site’s WordPress interface -> Plugins. If the plugin install failed, download the plugin and install it manually (see instructions below). Look for “HostPapa Analytics and Online Marketing” and click Activate. Once the code has been installed, AdGuru receives tracking data from your website, telling us how visitors behaved when visiting. You’ll be able to see which pages visitors browsed, whether they accomplished specific goals (such as a purchase, download or form submission) and identify how those visitors arrived at your site. Together, this data helps us understand which ads are really driving traffic and sales to your site. We can use that insight to predict what other visitors will do. Additionally, we can identify those users making multiple visits to your website. Which of your ads is generates the most visits. Which page of your website visitors spend the most time on. How many returning visits to the website it takes before purchases are made. With the Tracking Code installed, you can get to work planning your first campaign on the AdGuru portal. As it’s your first campaign, take some time to work through AdGuru’s simple, step by step creation wizard that makes it easy to precisely target your campaign. First, be sure to complete an AdGuru business profile. This helps AdGuru support specialists better understand your business better so they can get you up and running with the service. 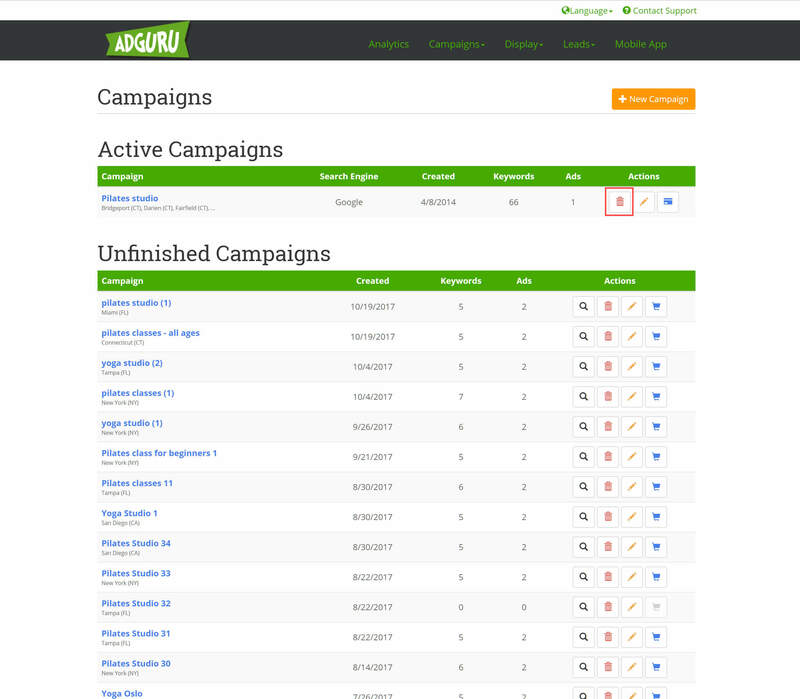 Log into the AdGuru dashboard and select Campaigns > New Campaign from the top navigation menu. Click the Get Started button to continue. Complete the information required for targeting. Enter your Company Name and Website URL (if not previously completed) and select the relevant option under What are you using this campaign to do? Enter your Products & Services and a location (Countries, States/Provinces or Cities) for your Campaign Target. Click the Continue to Keywords button to continue. Next, you can pick search keywords you wish to target. AdGuru uses the information entered in the Products & Services boxes to recommend popular keywords. Rate the recommendations with the thumbs up or down buttons. 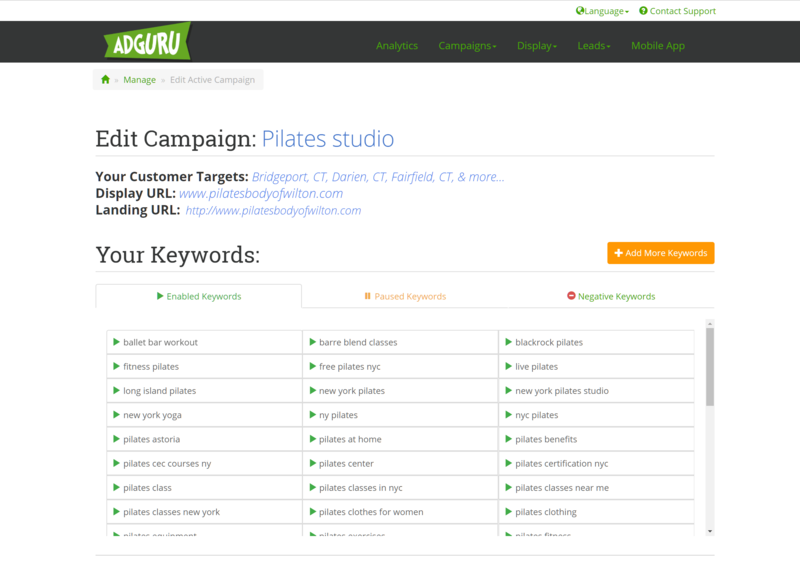 If you struggle to find keywords that work, please contact the AdGuru team for support. Once you’ve added five keywords to your campaign, click Continue to Ads. You’ll be invited to create a sample advert, with a headline, sub-heading, and two description lines. You can use your own text, or pick one of our recommended options. You’ll see a preview of your ad as its content is built. Once you’re ready to proceed, click the Continue to Preview button. When you are happy, go ahead and purchase the campaign. Once it has been purchased, AdGuru’s support specialists will review your selections to ensure optimal performance. 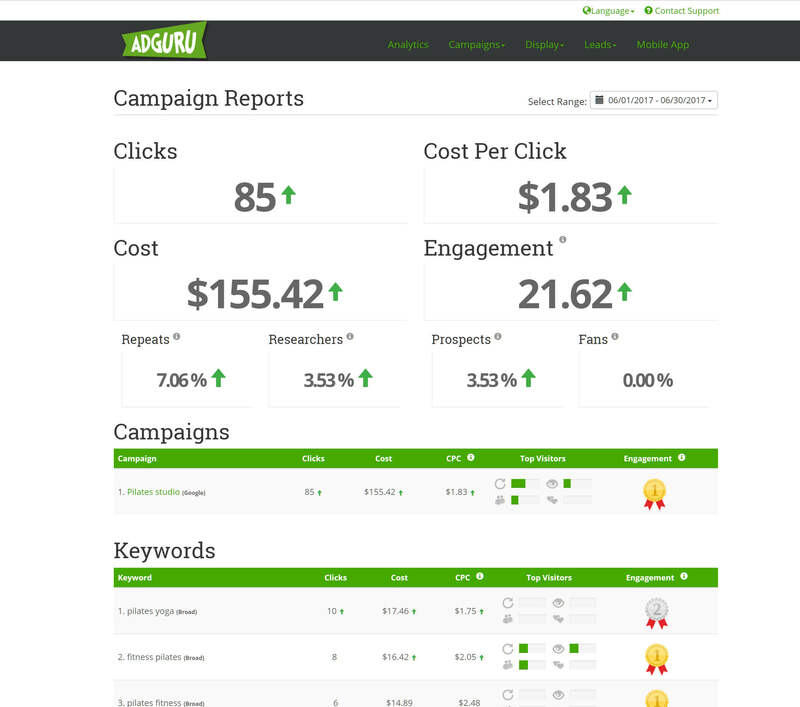 Once your campaign is running, take advantage of AdGuru’s comprehensive, yet easy to understand performance reports. Log into the AdGuru dashboard and select Analytics from the navigation menu. At the top of the page, you’ll see the latest insights regarding visitor behavior and campaign performance. Click Learn More to review the information and associated recommendations to further optimize your campaign. 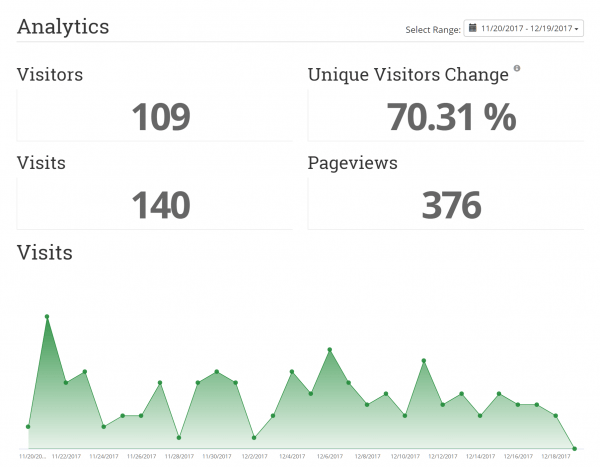 Below, you’ll see a summary of key site analytics, including Visitors, Visits, Page Views and more. You can change the date range reported by clicking the drop-down menu at the top right of the Analytics section. As you continue to scroll down the page, the insights presented become more detailed. 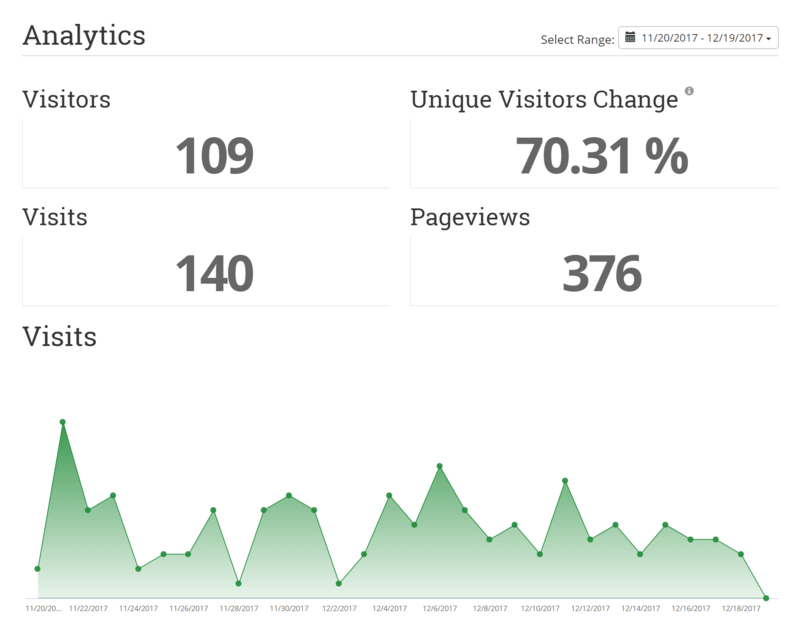 Visitor statistics include the number, average visit duration, a breakdown of visitor types including Repeat Visitors, Prospects, Fans and Researchers (Intelligently classed based on behavior on the site) and an Engagement rating. Learn more about reviewing your campaigns in this HostPapa Knowledge Base document. If you wish to make changes to your campaign, you can do so from the AdGuru portal. Select Campaigns > Manage from the top navigation menu to get started. You’ll be presented with a list of Active and Unfinished Campaigns. In the Actions column, click the pencil icon to edit a campaign. If you wish to stop an AdGuru campaign that is currently in progress, you can choose to pause the campaign temporarily or cancel it altogether. Pausing the campaign is a good idea if you wish to make changes to the site to optimize performance, allowing you to pick up the campaign when the improvements have been implemented. To pause a campaign, open a support ticket and the AdGuru team will be able to help. If you’re unhappy with campaign performance, before you decide to cancel completely, be sure to ask our AdGuru paid search specialists to review the campaign and/or your website. They’ll look at your ads, campaign performance and landing pages to seek insight and recommendations for increasing click and/or conversions. Some simple tweaks may pay dividends. 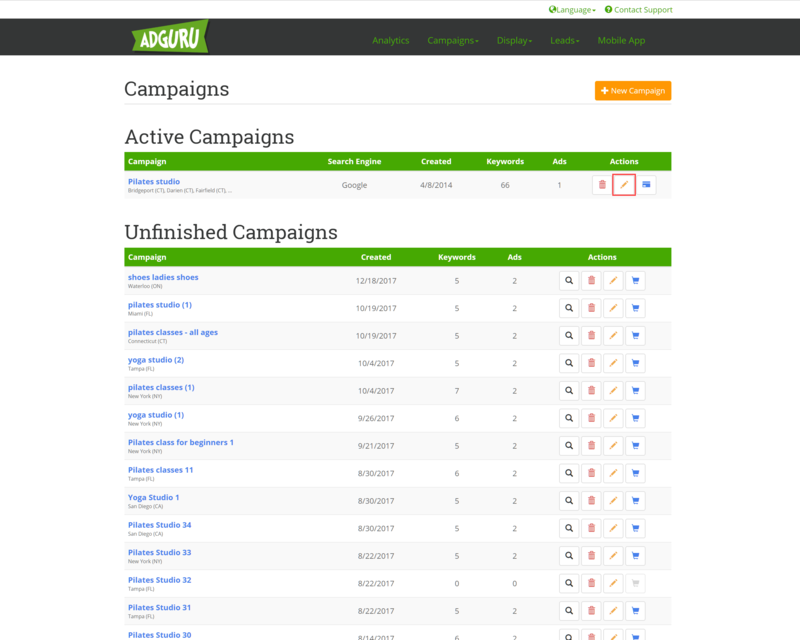 If you subsequently decide to cancel the campaign, head to the AdGuru dashboard and select Campaigns > Manage from the top navigation menu. Find the campaign you wish to stop and click the Cancel button (trashcan icon) to proceed. Your AdGuru account is equipped with additional tools and services to optimize and improve your sales conversion. Measure visitor engagement – how long visitors stayed on your website, how often users visit the site and more. Identify visitor trends such as popular posts and pages. 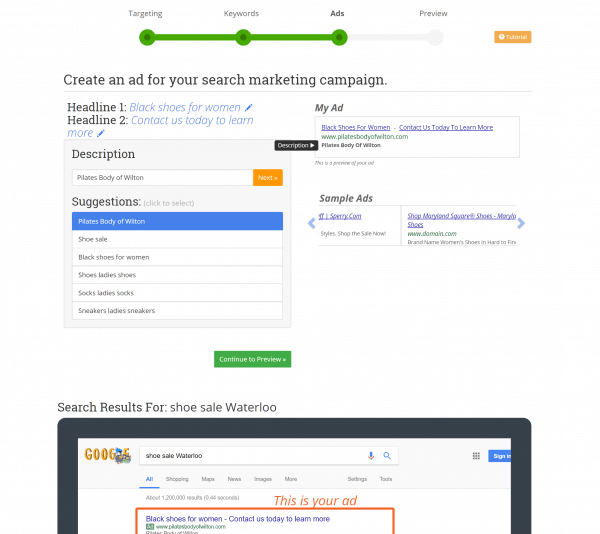 Evaluate campaign keywords and identify priority options. Keywords are color-coded to show visitor engagement. Keep in touch with website analytics, campaign performance and manage leads on the move with the free AdGuru My Site Analytics Mobile app, available for iOS and Android devices. Once installed, as soon as a lead comes in from your website, we will send a notification to your device. You will be able to get back to your visitors right away, schedule follow-ups, and send them additional offers. You can find out more about the mobile app in the AdGuru dashboard, by visiting Leads > Mobile App. AdGuru Connect is a lead generation tool that allows you to display promotional offers to your website visitors while browsing. You can choose promotions to appear in a dedicated tab or pop-up modal window, displaying a coupon that can be issued in a variety of ways, including email or text message. A small embedded contact form allows visitors to get in touch and you can include relevant information about your business, including opening hours and location. 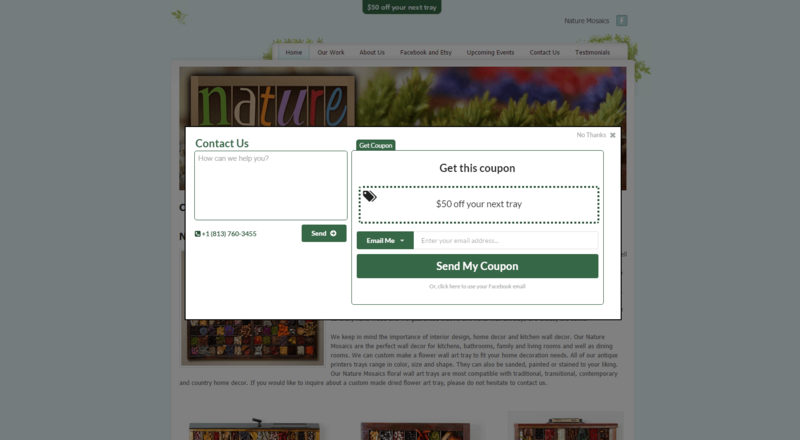 When a visitor requests a coupon, you’ll be notified via the AdGuru mobile app, giving you the option to contact the prospective customer right away. 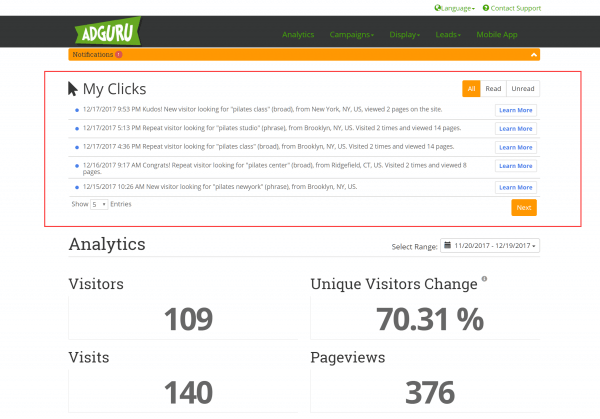 Be sure to also take advantage of AdGuru’s Goal Tracking tool. The feature allows you to create and then monitor specific goals pertaining to website use – for example, a customer checking out, or sending a contact form. Goal Tracking monitors and records when those tasks are completed, the visitor details and how the visitor arrived at your site – whether they came from organic traffic, or an AdGuru campaign. To take advantage of Goal Tracking, ensure you have AdGuru analytics installed and then head to the Account section of the Dashboard to start creating your Goals.